I purchased this for my wife for Mother's Day thinking it would be a funny and yet wonderful gift. I was a last minute planner, ordering this with barely a week to spare. My order was processed incredibly fast and I have to say it turned out far better than I could have dreamed. 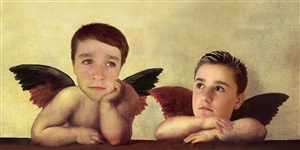 I named my review "Hellarious" because my son and I are kind of mean, tough blokes, so a picture of us as angels is fantastic. My wife loved it, my co-workers thought it was the funniest thing they've ever seen. It just represents a funny and yet high quality gift that let my wife know she's loved and appreciated. I will be back for another unique gift in the future. We choose a frame from somewhere else, partly so we could travel with the canvas rolled up. 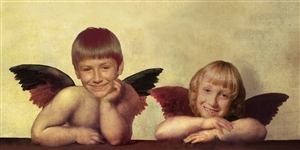 After the first iteration we asked the artist to better match our faces' skin tones to those of the arms. After this was done we confirmed the order and it was shipped.